It is difficult for us to imagine what this holy hill looked like almost 1500 years ago. My impression is that most of the island was covered by forest. There might have been half a million people in the whole country, mainly in clearings in the forest and near a river. Both Gartan – where Columba was born – and Derry - where he spent so much of his life – were hilly areas near water and offering some form of protection. But Columba did not come to Derry to enjoy the view or go bathing in the Foyle ever day. He developed a monastery where arts and crafts could flourish – but his main goal was to build a place where people could flourish with the grace that comes from knowing about Jesus. He came to build up people, not merely to build an institution. So I think he would ask us here today what we are doing today to build up people in this diocese, and where the Gospel of Jesus fits into that picture. The challenges that Columba faced are very different from those who existed here 1500 years ago – but in some ways, human nature changes very little. The one thing that we cannot do is to keep doing the things we always did and hope that some different result will come out it. What worked in 550 when Columba was 30 would not have worked in 1950 - and what worked when I was a child will not bear fruit in the very different circumstances of today. For the last two and half years I have been working with a group of lay people, religious and clergy to clarify what our priorities are. 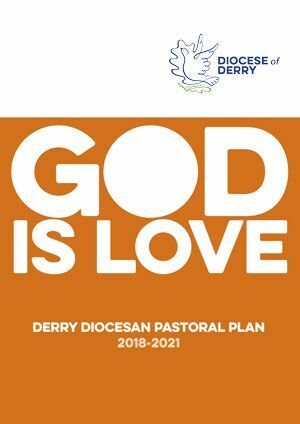 And today on the Feast of St Columba, our diocesan patron, I would like to launch the plan. It is based on a simple assumption. The job of the priest is not to get laity to help him with his work. The job of the priest is to equip the laity of each parish to work together and to do their work. It is in the parish that the Church becomes real – or fails to become real – for the parishioners. It is locally that the Church becomes salt to the earth and light to the world – or fails to bring light and beauty to the world. We have prioritised three themes for each parish. Firstly, in a world where there is 'an epidemic of loneliness', we pledge to work at building 'welcoming and inclusive communities'. In a consumerist culture there is the temptation to see church just a place that provides a range of nice services that we can get when we feel we want to have them. Sacraments can become pleasant occasions in a religious context. But many then go away and only come back when there is some nice event, whether it be a wedding or funeral, a novena or Christmas. But the Body of Christ is made up of living cells where people have roles to play inkeeping the body healthy and not just religious events to attend. Belonging to a community is counter-cultural in a society which emphasises appearances and locked doors, individualism and superiority. But community is essential in the fight against loneliness. And we also recognise – as Pope Francis has made clear – that church communities can sometimes be seen as being exclusive, a place for the perfect with little room for those who limp along through life. Jesus got his hands dirty when he mixed with tax collectors and sinners. A welcoming community is a fragmented society has to be a place where those who feel most alienated can find a welcome – and given time to get back on their feet again. It is not a place were people should ever feel looked down upon. That will take a lot of work. It willnot happen by accident. Our second theme is being 'disciples of Jesus Christ, growing in faith together'. In an earlier generation, people learned about faith from the world around them. Generally that does not happen now. Membership of Church is not just about huddling together like people under siege from the enemy outside. Parish is a place where the local disciples of Jesus gather to share their journey, celebrate their identity and support one another. If we fail to actively help people grow in faith together then we become a social club, destined to die out sooner or later because it fails to replenish its membership. This theme will expect parishes to develop the celebrations of Sunday Mass, have a parish dimension in people's preparation for the sacraments and help adults develop a mature understanding of their faith so that they can share it with their children and their work colleagues, their neighbours and those who would like to know more. Only a maturing faith, developed in family and in community, will be able to survive the overwhelmingly secular culture in which we live. The Gospel teaching about God and grace, sin and salvation will be unwelcome in many quarters where healing comes from retail therapy alone. Our third theme is working 'to make Jesus known and loved'. Parish is not just a community nor merely a place that knows about faith. It is a beating heart where parishioners love Christ in the scriptures and in the sacraments. Without him we cannot bear fruit, for he is the vine and we are the branches. And that prayerful love of God will be developed in the family – whatever that family looks like – and in the wider community, as people grow more mature. Our Catholic tradition is strongly based on the sacraments. They were left us by Jesus as key sources of his grace and healing. The plan emphasises a substantial role for Eucharist adoration, the Sacrament of Reconciliation and prayer in all its forms. But that prayer is not about making us a holy huddle. Rather the plan insists that we reach out - where possible with other Christian churches - to work against injustice. Our church tradition has a long history of men and women who sought to deal with social problems when others were unable or unwilling to deal with them. Jesus went to the lepers, the smelliest and most disgusting of his fellow men and women. Out in the peripheries is where Christian communities have always been at their best. We do not go to bring Jesus among the needy. We go to find him there. St Columba was a courageous person who built a monastery where there would be a safe community, a place where the faith was taught and a holy spot where prayer was at the centre. He asks us to do the same in our time. Anything less would not be a celebration of his heritage but an insult to it.